Emerging antimicrobial resistance is threatening our ability to treat bacterial infection. The Infectious Disease Society of America indicates that in the next decade we will lose our ability to treat the most common causes of bacterial infection, the so called ESKAPE pathogens: Enterococcus faecium, Staphylococcus aureus, Klebsiella pneumonia, Acinetobacter baumanii, Pseudomonas aureugosa, and Enterobacter sp. The US Centers for Disease Control and Prevention additionally cite carbapenem-resistant Enterobacteriaceae (also know as CRE) among the most serious antibiotic resistance threats. New antimicrobials to treat these multi-drug resistant pathogens are urgently needed. Therefore, the Kirby Laboratory, funded by grants form the National Institutes of Health, is taking a number of approaches to identify and develop next generation antimicrobials. Our approaches build on an understanding of how bacterial pathogens causes disease and evade therapy by current antibiotics. (1) Attacking the biology of Gram negative infection. Type IV secretion systems (T4SS) are syringe like mechanisms used to inject virulence factors into hosts cells. These systems are absolutely required for virulence in Gram negative pathogens such as Legionella pneumophila, Brucella, Bartonella, Coxiella burnetii, Rickettsia, Anaplasma, Ehrlichia, and Helicobacter pylori. Therefore, we predict that small molecule inhibitors of T4SS should render such organisms avirulent. In doing so, they will serve as a new type of therapeutic agent -- that blocks virulence rather than directly killing the pathogen directly. They will also serve as new scientific tools to explore the biology of these important bacterial virulence strategies. To date, we have used Legionella pneumophila as a model system to identify and establish proof of principle for type IV secretion system-based therapeutics. Using a high throughput screening approach, several lead candidates and scaffolds have been identified. We are exploring the relationship between activity and structure of compounds to define important structure motifs, so called structure-activity relationship (SAR) studies. We are also characterizing activity of compounds in several infectious model systems. (2) Screening for inhibitors that act on the pathogen, pathogen-host interface, and/or host cells to limit intracellular bacterial replication. We recently described a novel high throughput screening technology (highlighted on the cover of the May issue of Assay Development and Technology) to measure contemporaneously and in real-time effects on both intracellular growth of Legionella and host cell viability. This methodology has allowed us to rapidly screen 200,000+ compounds for intracellular growth inhibition, while at the same time weeding out compounds that are toxic to eukaryotic cells. In this way, our screening hits are enriched for those with therapeutic antimicrobial potential. We are developing high throughput screening technologies to identify small molecules that restore antimicrobial susceptibility in multi-drug resistance strains, specifically carbapenem-resistant Enterobacteriaceae (CRE), a CDC-designated urgent antimicrobial resistance threat. These include multidrug-resistant Escherichia coli, Klebsiella, and Enterobacter species. CRE are defined, as their name implies, by their resistance to carbapenems, a broad spectrum antimicrobial therapy, often the agent of last resort in multidrug-resistant Gram-negative infections. Carbapanems are beta-lactam antibiotics. Resistance is usually related to the activity of carbapenemase enzymes encoded on large multidrug resistance plasmids. Resistance to carbapenems generally confers resistance to all other beta-lactams including penicillins and cephalosporins. During the past several years we have seen significant emergence of CRE in the United States and throughout the world. Often CRE remain susceptible to only toxic antimicrobials such as colistin or aminoglycosides (kidney failure, hearing loss) and sometimes are resistant to all clinically available antimicrobials. Restoration of susceptibility to non-toxic agents such as carbapenems would therefore provide considerable clinical benefit. Separately, we participate in a multi-institutional collaboration spearheaded by the Broad Institute to sequence the genomes of CRE and are collaborating with Ashlee Earl's group at the Broad Institute to define mechanisms of resistance. Analysis of antimicrobial susceptibility of intracellular pathogens such as Legionella pneumophila has been problematic. Traditional broth dilution susceptibility testing does not fully address access of antimicrobials to the intracellular replicative niche. Therefore, initial suggestion of therapeutic efficacy of beta-lactam antibiotics proved clinically incorrect. Assessment of effects on intracellular replication is technically complex. However, using high throughput screening technology developed in our laboratory, we were recently able to analyze the effects of ~250 known antibiotics against intracellular growth of Legionella pneumophila. Results correlated with known therapeutic efficacy against Legionnaires' disease. For example, later generation macrolides, but not erythromycin, were potent, as were almost all quinolones. Interestingly, previously under-investigated antimicrobials in Legionnaires' disease such as minocycline and florfenicol showed excellent potency. Furthermore, taking advantage of digital dispensing robotics, we were able to address two and three dimensional synergy for the most potent antimicrobials against intracellular growth. 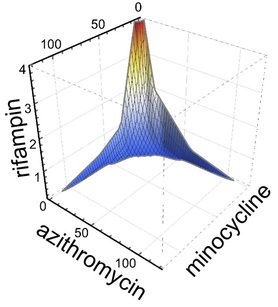 Image from AAC Accepted Manuscript Posted Online 21 September 2015, Antimicrob. Agents Chemother. doi:10.1128/AAC.01248-15, Copyright © 2015, American Society for Microbiology. All Rights Reserved. What is synergy? Synergy is the ability of two or more antimicrobials when you used together to have much greater effect than the sum of their separate effects. Or in other words: A + B (observed) >> A+B (expected). 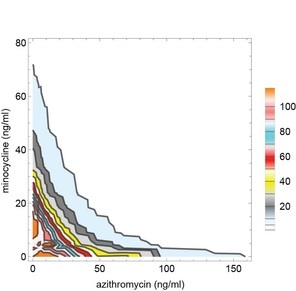 ​Sometimes synergy is graphically represented by plotting the permutations of antibiotic concentrations that results in inhibition of bacterial growth. These plots are known as isobolograms. ​Intriguingly, when used in triple combination, azithromycin, minocyline, and rifampin showed even more potent three dimensional synergy. Specifically, when used in triple combination, only one tenth the concentration of each antimicrobial was required to inhibit intracellular growth compared to when each antimicrobial was tested separately. See graph to the right showing an isobologram surface, connecting points of 99% intracellular growth inhibition, demonstrating a high degree of surface concavity. It is intriguing to consider therapeutic implications and application of this data, especially in disease processes such as lung consolidation where penetrance of antimicrobials may be less than ideal. Just as importantly we found that combinations that might be used in severe community acquired pneumonia such as ceftriaxone plus azithromycin or ceftriaxone plus levofloxacin were not antagonistic. Furthermore, levofloxacin did not show synergy with azithromycin (or any other antimicrobial tested), indicating that the occasionally combined use of azithromycin plus levofloxacin for severe Legionella pneumonia is unlikely to provide benefit. From Antimicrob. Agents Chemother. doi:10.1128/AAC.01248-15, Copyright © 2015, American Society for Microbiology. All Rights Reserved. Antibiotic concentrations are in ng/ml.